This Saturday morning (27th April) in the Glossop Market Arcade will see this months and the last of the current council’s Glossopdale Labour Councillors Shoppers Surgery. The surgery runs from 10 am until 11.30 am in the Glossop Market Arcade across from Norfolk Square. If you can’t attend on Saturday, please remember that Councillors are not just available at surgeries, and you can find more ways to get in touch with me by clicking here and with the other local Labour Councillor by looking on our website at http://hplg.info. If you are not sure whether it’s something we can help with, please have a look at our ‘local councillors what can we do for you’ page on by clicking here or just come along and ask on Saturday morning. If you cannot make it this Saturday, we’re hopefully (elections pending) back again, as usual, same time, same place on the last Saturday of the month (25th May) for our May Councillors shopper’s surgery. Saturday morning (23rd February) in the Glossop Market Arcade will see this month’s Glossopdale Labour Councillors Shoppers Surgery. The surgery which runs from 10am until 11.30am in the Glossop Market Arcade, just across from Norfolk Square will feature High Peak Borough Councillors Graham Oakley who represent Whitfield, Godfrey Claff and Damien Greenhalgh from Howard Town, Nick Longos from Padfield, Bob Mckeown from Hadfield South, Anthony Mckeown from Gamesley and County Councillor Becki Woods who represents Etherow. If you can’t attend on Saturday, please remember that Councillors are not just available at surgeries, and you can find more ways to get in touch with your local Labour Councillor by looking on our website at www.hplg.info. 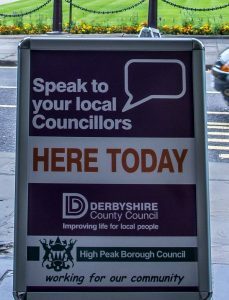 Alternatively, you can get details for all the other borough Councillors on the borough council’s website at http://www.highpeak.gov.uk/, and for county Councillors at http://www.derbyshire.gov.uk. If you are not sure whether it’s something your local councillor can help with, please have a look at our ‘local councillors what can we do for you’ page on our website, or just come along and ask on Saturday morning. If you cannot make this Saturday, we’re back again, as usual, same time, same place on the last Saturday of March for our March shopper’s surgery. Saturday morning (26th January) in the Glossop Market Arcade will see the first of this year’s Glossopdale Councillors Shoppers Surgery. The surgery which runs from 10am until 11.30am in the Glossop Market Arcade across from Norfolk Square will feature High Peak Borough Councillors Graham Oakley who represent Whitfield, Godfrey Claff and Damien Greenhalgh from Howard Town, Nick Longos from Padfield, Bob Mckeown from Hadfield South, Anthony Mckeown from Gamesley and County Councillor Becki Woods who represents Etherow. 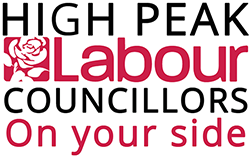 If you can’t attend on Saturday, please remember that Councillors are not just available at surgeries, and you can find more ways to get in touch with your local Labour Councillor by looking on our website at group.labourhighpeak.info or just come along and ask on Saturday morning. If you are not sure whether it’s something your local councillor can help with, please have a look at our ‘local councillors what can we do for you’ which you can view by clicking here. If you cannot make this Saturday, we’re back again, as usual, same time, same place on the last Saturday of February for our February shopper’s surgery of the year, or alternatively, you can get in touch by clicking here. 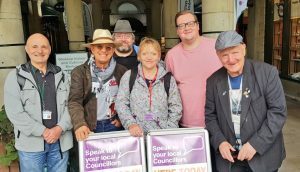 Breaking point, plastics and council tax are the themes for three motions that the High Peak Labour Group are putting before the December Full Council meeting. The breaking point motion is in support of the LGA (Local Government Association) Labour Groups Breaking Point Campaign against the current Conservative Governments austerity program and cuts to local government and local government services. Our plastics motion looks to get the council to take measures to tackle the amount of single-use plastics, looking at some ways that the amount of single-use plastics can be reduced, drinking fountains and options to increase recycling. 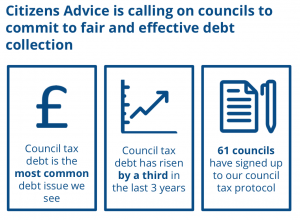 On council tax, our motion to the council is looking at ways to tackle the number of cases that the council refer to bailiffs and to get the council to sign up to the citizen’s advice council tax protocol. The citizen’s advice protocol was developed in partnership with the Local Government Association, it offers practical steps aimed at preventing people from getting into debt and outlines how to ensure enforcement agents act within the law. This coming Saturday morning (29th September) in the Glossop Market Arcade from 10 am until 11.30am will see this month’s Glossopdale Councillors Shoppers Surgery. However this month, it’s not just an ordinary Councillors Shoppers Surgery, as there will be cake as well as the Councillors, to celebrate the seventh anniversary since the last Saturday of the month Councillors Shoppers Surgeries started. If you cannot make this Saturday, we’re back again, as usual, same time, same place on the last Saturday of October. 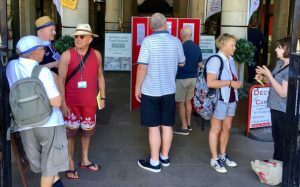 The morning of Saturday 25thAugust in the Glossop Market Arcade from 10 am until 11.30am will see this month’s Councillors Shoppers Surgery. If you can’t attend on Saturday, please remember that Councillors are not just available at surgeries, and you can find more ways to get in touch with Glossopdale Labour Councillors by visiting the website at www.group.labourhighpeak.info or alternatively for all other borough Councillors on the borough council’s website at http://www.highpeak.gov.uk/, and for county Councillors at http://www.derbyshire.gov.uk. Whilst, the surgery has no particular theme, the councillors will have copies of and are encouraging responses to the current tenant involvement consultation that High Peak Borough Council are running and which comes to a close at the end of August. If you are not sure whether it’s something your local councillor can help with please have a look at the ‘local councillors what can we do for you’ page on Cllr Anthony Mckeown’s website at www.anthonymckeown.info or alternatively just come along on Saturday and say hello. If you cannot make this Saturday we’re back again, as usual, same place, same time on the last Saturday of next month.